I've often thought that the Aerial Tower Ride was the ugliest attraction at the Fair. It's also one that's hard to find good photos of, as the bright sky behind it often masked out details of the ride itself. This shot from July 1965 captures some of the often-lost details. The photographer obviously knew how to use a light meter. I agree, very ugly. It was also just dumb idea. It seems as if every fair had some variation on so-called thrill rides from previous fairs. This thing was a bizarre interpretation of the 1939 Parachute Jump...I think. Whatever it was, it could not possibly have attracted many customers. The thing was just ridiculous. Yep, that's about the dumbest ride I ever saw. But the engineering is wonderful! The 1939 Parachute Jump wasn't really a thrill ride although it intended people to think it was (and artist's conceptions helped selling it as such)- I've heard there was really no discernable 'weightless' drop at all, because the parachute canopy was deployed at all times and didn't have to open like a real sky diver would experience. 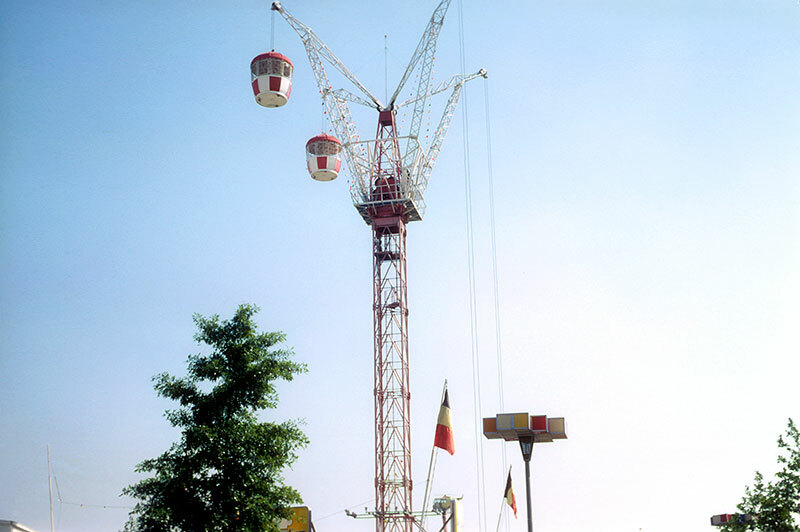 The 1964-65 Aerial Ride on the other hand, didn't even make any such pretenses about weightless drops. It was more like going up an elevator for the view, then coming back down. Many people seem to go for vertical 'view' towers. So many parks have them, such as Sea World. And apparently this one sold enough tickets to remain open the entire two years, so a moderate success. I'll bet the parachute drop was exciting at the time, and would be even now.... and I've made 125 real parachute jumps. I used to ride the one at Riverview in Chicago, and it was exciting, especially since you were on a narrow seat and seemingly ready to fall off the thing. (It was even more exciting for my Mom and Dad when they were dating and were stuck at the top for a while. I understand that guys would pay off the operator to arrange that.) The only real "drop" was the initial few feet, with constant descent speed controlled by the support cable the rest of the way down. A much later parachute ride at Knott's Berry farm, using a stand-up cage for the patrons, had a controlled acceleration for a good portion of the travel. The 1939 Parachute Jump, after its move to Coney Island when the Fair closed, was used for training by the Army Air Corps when the War started. Built in 1936 based on an existing observation tower, but according to plans for the military training model; first civilian use. I have no recollection of the Aerial Tower Ride. It wasn't on my tour. I don't remember even seeing it or hearing about it.